True story: About a year ago we were chatting with a 21-year-old and asked what she thought was the most important factor when purchasing a car. Her answer was swift and sounded like “ox cord.” Well, it wasn’t that; it was an “aux cord” short for an auxiliary cord to plug in devices. A few years ago, young consumers may have been more inclined to answer with features such as safety, gas mileage, reliability, and affordability. But today is different. There is no denying that for all of us – young and old – our smartphones have grown into a virtual extension of ourselves. We use our hands so often to access features that it has become second nature and integral to how we move through the day. With that in mind, Acura has integrated Apple CarPlay™ and Android Auto™ into its vehicles starting with the 2017 NSX, and now the 2018 TLX and MDX models. These technologies take key features from your phone’s home screen and display them on the upper On Demand Multi-Use Display (ODMD). They even let you use the phone’s native voice command system: Siri® for the iPhone or Google Voice™ for Android devices. Simple set up makes Apple CarPlay™ and Android Auto™ easy to use. Just plug the phone into the USB port and follow the on-screen instructions for the vehicle and phone. No codes to enter and no new procedures to master or memorize. The Apple system displays the same icons you see on your phone, and the streamlined Android system organizes information in familiar-looking cards. Accessing the phone’s functionality is as easy as pressing and holding the Voice Command button on the steering wheel for two seconds and giving verbal instructions to Siri or Google Voice. In the digital age, familiarity and ease of use are real luxuries. Whether using the phone, music, maps/navigation, or any of the growing number of third-party apps, the upper screen on the vehicle’s dash will respond and operate just like when using your phone. Visit Valencia Acura’s showroom floor and let our sales team demonstrate how easy and intuitive these new technologies are to operate. 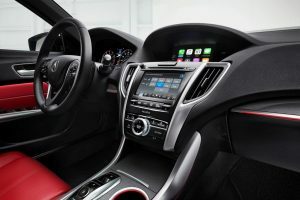 No wonder there are so many Acuras on the road in the Santa Clarita Valley with connectivity like this combined with Acura’s precision crafted performance DNA. Celebrating 20 years serving the community, Valencia Acura is a local, family-owned and operated car dealership located at 23955 Creekside Road in Valencia. Valencia Acura has been recognized as a prestigious Acura Precision Team Dealership for 11 years, awarded Acura’s Council of Excellence for 13 years, and voted Santa Clarita’s Best New Car Dealership for 15 years by the Signal newspaper. Owners Don and Cheri Fleming can be reached at (661) 255-3000. Visit www.ValenciaAcura.com.